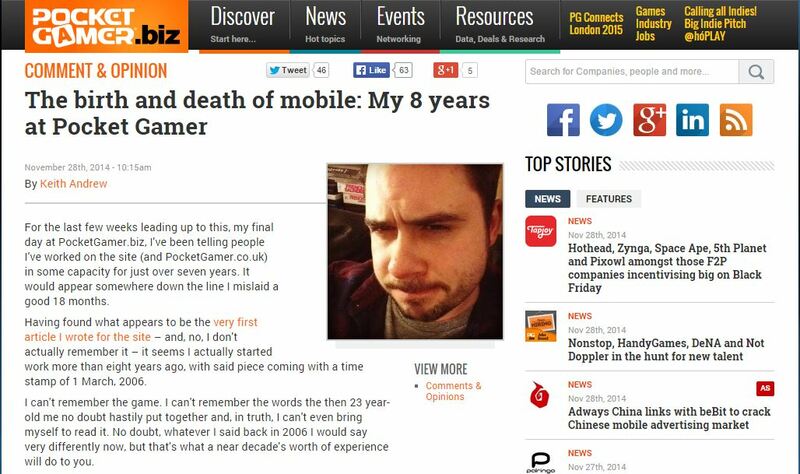 My last piece for PocketGamer.biz, the site I was Editor of for two years, has just gone live. For the last few weeks leading up to this, my final day at PocketGamer.biz, I’ve been telling people I’ve worked on the site (and PocketGamer.co.uk) in some capacity for just over seven years. It would appear somewhere down the line I mislaid a good 18 months. Having found what appears to be the very first article I wrote for the site – and, no, I don’t actually remember it – it seems I actually started work more than eight years ago, with said piece coming with a time stamp of 1 March, 2006. I can’t remember the game. I can’t remember the words the then 23 year-old me no doubt hastily put together and, in truth, I can’t even bring myself to read it. No doubt, whatever I said back in 2006 I would say very differently now, but that’s what a near decade’s worth of experience will do to you. What I do remember, however, is the era in which said release – FDG Entertainment’s Puzzle World – existed in, and how fundamentally different it was to the mobile scene Pocket Gamer now covers.